A staggering 97 per cent of British consumers are not sure that companies take enough care with their personal data - leaving them open to identity theft and fraud. 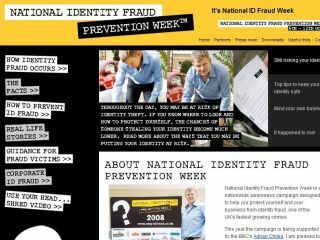 Research released to coincide with the start of the horribly named but very important National Identity Fraud Prevention Week (NIFPW) suggests that nearly everybody is worried about how their personal data is handled. But perhaps even more worrying is the fact that 92 per cent of people feel that their own employer may not be able to keep customers' personal data safe. Identity fraud is a massive and growing danger in the online world – and NIFPW is aiming to raise awareness of the problems that losing your personal data can cause. With the right information, people could find that fraudsters set up credit cards, buy goods and even send out spam emails in their name – leaving an enormous mess behind and potential financial hardship for the innocent victim. NIFPW have picked out the BBC's Adrian Chiles as their figurehead for this year (we don't know what the selection criteria was either - perhaps Christine Bleakley was too busy with Strictly Come Dancing) - and he outlined the dangers in a chilling Black Country accent. "Britain's businesses have come a long way in protecting employees and customers from identity fraud," commented Adrian Chiles. "Yet, while many have introduced stringent identity fraud prevention policies, more than a fifth of businesses in the UK still don't have comprehensive strategies in place."